Below is one of the essays I discovered in my lost cache of writing. I wrote it in 2002. My children were 12 and 8. There was a big battle in South Carolina regarding the Confederate flag and it’s place on the State Capitol grounds. As a mother, I was looking for a way to address this that was open and honest. I had raised my children to accept and honor the differences of others. Of course, not everyone raises their children the same way. Anyhow… I feel myself attempting to explain the following piece. I’ll stop and let it stand for itself. It’s long-ish, by the way. There is a huge Confederate Flag waving from my neighbor’s front yard. I mean huge. Must-have-special-ordered-it huge. Gigantic. You can see it the second you turn at the corner by the city ballpark and soccer field. The lush, green field is teeming with little children in bright red and blue and orange uniforms. They kick a black and white ball across the wide expanse of grass while their parents yell encouragement and billowing behind them – glowing red like the backdrop of a Radio City Music Hall show – is the flag on a hand constructed wooden structure. 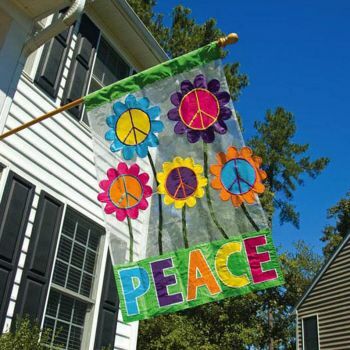 The stars and stripes used to hang in the place of honor from a pole by their front door; but it’s overshadowed now, by its radical cousin, rising insistently from the middle of the front yard. It demands to be seen. It is making a statement. I just don’t know what it is. You see these are more than just neighbors. We’ve known each other for years. These are the folk I’ve shared day-to-day banalities with and the quirky twists of daily living. Mrs. Waring, severely arthritic and barely able to catch her breath from her front door to the mail box, hand crocheted queen-sized blankets for each of my children when they were born. When she could no longer walk across the street, we’d stop in to visit her. Once, when she’d burned her feet, insensitive due to diabetes, in a hot bath, my grandmother went over to help dress and bandage them. The burns wouldn’t heal and she went back to the hospital. She didn’t come back. We missed her. Two of the grandchildren are the same age as our children. My husband and I commiserated when the second granddaughter was born with a congenital heart defect. And we prayed for her recovery when the surgeons opened her tiny chest. She’s fine now, though small for her age. Mr. Waring is an old WWII vet. Every morning around 6:00 a.m. before he retired from his job, I would hear his old station wagon beeping as he backed out of the driveway. Once he retired, I’d still see him daily, patrolling the neighborhood, his suspenders determinately anchoring his pants under his low, large belly “How you doin’ today, Mr. Waring?” I’d ask whenever I saw him. “If I was any better, I’d be dancin’ a jig!” he’d say every time. Even when he buried his eldest daughter. Even when his wife died. Even when his own health began to fail. “See you later, Mr. Waring,” “Have a great day today and a better tomorrow!” he’d reply. Each time. He was a cheerful man. His son resembles a big bear. I’d see him sometimes down on the waterfront with a shrimp net, his dingy tee stretched to the limit of its cotton fibers, playing hide and reveal with the hairy mountain of his stomach. Grime on his hands and on his bearded face. He was friendly whenever we met. His wife was straight out of a Flannery O’Connor novel — bland, blond, a little blank –but neighborly all the same. We loaned them our Chevette for a while when their car was stolen from a local parking lot. They’d stop by our porch and we’d talk about our kids. The daughter, Karen, was the one my kids really loved. They even called her Aunt Karen like her nieces did. And talk about affectionate. Whenever Karen saw one of us in public she would stop what she was doing and wrap us in a big hug, whether we wanted one or not. We could count on Karen being happy to see us, even in the checkout line at K-Mart where she worked in the plant and yard care department. Karen was the one who brought over birthday cards and walked Grandma’s dog when she was ill and who watered the garden when we were away. She told me once that they’d never lived close to colored people before but we were the nicest neighbors she could ever have. I accepted that in the spirit in which it was offered. We thought they were pretty nice too. When we moved to a nearby neighborhood we maintained our friendliness. We still owned the house across the street and they still looked out for it. And no matter what and no matter where, Karen still greeted us with a hug. We were good neighbors. We respected each other and looked out for each other the way good neighbors do. So I did not know what to feel when I turned the corner and saw the flag, so big and bright it could not be missed. In South Carolina that flag has many meanings. As the battle to remove it from the State Capitol heated up, the flags began to proliferate: on bumper stickers, lapels, flag poles. For some it represents slavery, oppressions, racism and intolerance. For others it is the heritage of their ancestors, states rights, old family tales. And for some, I assume, just a reason for a battle. Any old reason would do. All I can say clearly is what it means to me. What it feels like. My breath always catches when I see it. My pulse jumps. It is visceral. It feels like fear. I have to make a conscious effort not to recoil. I’ve heard the slogans, “Heritage, not Hate.” And when my 12-year-old daughter asked me what the battle was about I tried to be even-handed in my explanations. To talk about history from both perspectives. But my body knows differently and will not succumb to my logic. I am wary of approaching homes and businesses with the flag flying or drivers whose cars boldly bear it. I am wary of those who own those homes, businesses and cars. I do not know what they intend by the flags presentation. I do not know what they see when they look at me. My experience has taught me to brace for rejection, antagonism or worse and I must foster my energy to hide my reaction. When I can, I avoid such situations. I try to live Confederate Flag free as much as possible. But this is the Waring’s House. This is my neighbor’s flag. I’m not sure what to do, because I know these people. Did they become different people when they hoisted the banner over their yard? Did I become a different person when I saw it? I hadn’t seen any of the Warings for a few months before the flag went up and more time passed in which I didn’t encounter them. The flag on their lawn still occupied a corner of my mind, though, like a prod from an aching tooth or a dull headache. One day I decided to pick up some new plants for my flowerbeds. As I was heading out the back gate of K-Mart’s gardening section, my cart heaped high with potting soil and geraniums, I ran into Karen. My heart skipped. “Hi Karen, how are you?” I asked. I always do. She didn’t hug me. For the first time in years she didn’t hug me. I moved past her to the parking lot, pushing my cart into the hot Carolina sun. The thing is, I don’t know who held back. Did she? Or did I? I can already see a book of your essays. Save an early copy for me. You’ll be first on the list Paul! Thank you for taking the time to read it Nan. Add me to the list of buyers. This piece is heart breaking. I wish we could all see ourselves as children of The King, first and foremost , with beautiful shades of differences in our skin and stories. Bless you. Aloha, Miss Natalie. Reading your piece, I just wanted to hug you myself. I agree wholeheartedly with the commenter who talked about seeing everyone as God sees all of His children. Being blind myself I often wonder what the world would be like if everyone were able to see people the way God sees us all. Children have a lot to teach us adults. It’s our job to take the time to listen and take their lessons to heart. God bless you and your Ohana, family. Aloha to you as well! Thank you for the virtual hug. Hola Miss Natalie! Denada, you’re welcome! I hope you and your familia have a wonderful holiday and New Year! loved your essay. look forward to reading more. This is a beautifully shared insight. Thank you for sharing this. I will never look at that flag the same way again. Thank you 3guysandamom. Sometimes things are as personal as they are political. Maybe things are always more personal than political. We just forget. Natalie, thank you for this poignant description. What if each person accepted and honored each other’s differences? And taught their children to do so as well? of one’s thoughts and actions! I apologize up front for the length of this comment. I have much to say and cannot seem to get it any more condensed than what you are about to read. I have been looking for information on you and your family- sort of a “where are they now”. You see, I was too old to watch Gullah Gullah when it originally aired. I never knew it existed until one day, as a school teacher, I was covering a class for a colleague who had an emergency and she said, “we watch ‘Gullah Gullah Island’ every day during snack.” Thus was my first exposure. Years later, Jan 2015, to be precise, I received a Kindle Fire as a gift and let my toddler choose some streaming videos from Amazon Prime to watch. Our entire family has been hooked ever since! We watch the same episodes over and over (and over!) We sing and dance and enjoy the shows every single day. I know many of the songs from my years as a music teacher; it shocks my children to think of Mama teaching these same songs! I have fallen in love with you and Ron- as I understand you two had a significant influence on the show’s content- and wanted to see if there are other ways to connect with you, which brought me to your blog. It will seem now like I am changing subjects, but stick with me and I’ll connect the dots soon. This very week my mother was denied membership to a group because the leader of the group saw on her Facebook page where she had a post in support of the Confederate flag. (might be important to know we are Caucasian.) Mother and I spoke about the post. She does not see it as a support of racism or hatred or oppression or slavery or anything like that. She does not live as a racist or a bigot. She sees the flag as a symbol of the south. Simply being proud to be from a state in the southern-most corner of the country. Southerners with our slow drawls and our y’all’s. Our friendly manners and our high humidity. Taking barbecue when there is a death in the family or casserole for a birth. Hog jowls, black-eyed peas, collards, mashed potatoes, cornbread, and tea ..sweet and iced, of course! Going over to “mama n’em’s”. Her grandparents were cotton farmers and every single member of the family worked in the fields. Grandmother and Granddaddy couldn’t afford to hire anyone to help and probably would have seen it as a waste of money even if they could. Their eldest daughter had to drop out of college for a year when Grandmama had an unexpected baby 15 yrs younger than the last and they could no longer afford the $9 tuition. Yes, that says “nine”. As my grandmother often says, “we were poor as dirt but so rich with love.” Mother doesn’t think about the racial hallmarks of the south, but rather the rich culture that comes with southern heritage. The person denying her membership because of her post called her “insensitive”. My mother does not understand why she would say that. Here is where I tie the ends together. I plan to share this blog post with my mother, knowing she, too, has watched your show lately when babysitting her grandkids. We have discussed Gullah culture- what I’ve learned since January- and laughed that we both grew up thinking the “Br’er Rabbit” stories were “southern” since they were passed down orally in my family, never before knowing they are really Gullah Geechee! I hope reading this blog post can help her understand, better than a scolding Caucasian, why some see her support of the Confederate flag as insensitive. For my own part, it has certainly affected MY thoughts on the matter. Thank you so, so much both for your insight on this specific matter and also for still being accessible to “the public”. It feels so strange that I am writing to someone with your degree of success and yet, reading your words and every other thing I can find about you, you also sound like someone that would live next to me. What an amazing honor that would be! Please let Mr. Ron know “Gullah Gullah Island” is still reaching and teaching new generations every day! My 3 yr old and I sang the theme song tonight at bedtime as she was drifting off to sleep!